One of the more limiting things as a female Muay Thai fighter is that we have no real history, no archived past to attach ourselves to, to anchor our passion and propel us to greater achievements. We have the names and photos of western women with lots of belts, in recent times, and very few videos, but reach beyond a decade or so and the record of female Muay Thai just falls off into mist. And in terms of Thai female fighters, anything prior to 1998 is extremely obscure and subject to the dubious or incomplete aspects of oral accounts. Western men can not only think about the living greatness at Lumpinee and Rajadamnern, they can think back and dream about documented fighters of the past, a relatively long history of celebration. They can even dream of Muay Boran exploits woven into warfare, stories that root all of what we do in Thai history and culture. Women, on the other hand, almost have no history. This is even more true of Thai women who likely have been training and fighting in the provinces for an incredibly long time; but these stories, these women and their achievements, are unrecorded. Part of writing this article is an attempt to pull together just some of the important scraps that can attach us to female fighting history, so that there is something tacked down for the record. Events only 15-20 years ago are largely lost in a collective fog, and cut off by culture – even to those who lived through it. Thai women have not fought professionally since the late ’60s when Amnuay Kesbumrung, current president of the MTI and a former fighter himself, tried to popularize the sport by holding female bout at the famed Lumpini Stadium. However, he abandoned the idea after three years because the predominantly male Thai fans refused to watch — or more crucially bet on — the matches. In the ensuring four decades, the only place to see women boxing was a provincial temple fairs and festivals. These fights in Lumpinee may have only been held a handful of times – many people I’ve asked who were involved in Muay Thai at that time cannot remember them – but they count as the first “professional”, ie sanctioned, female fights in Thailand. 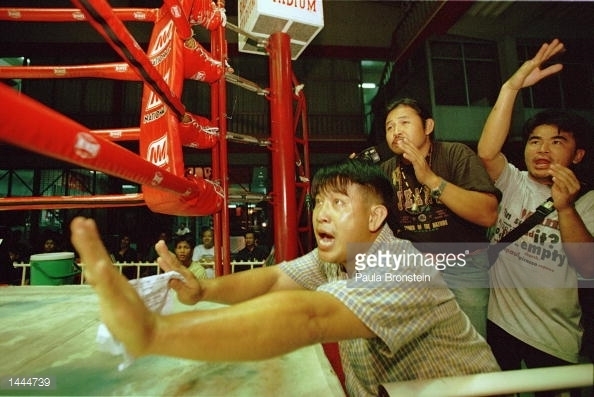 Of course nearly all fights in Thailand are professional, in that they involve monetary pay – which is why some western “amateurs” hide their fights in Thailand, as technically they are no longer amateurs (amateur status is most strict in the US), for instance by WKA rules – but these were in Bangkok at hallowed Lumpinee Stadium at a time when women weren’t fighting in, it seems, any permanent stadia, let alone one of the two national rings. 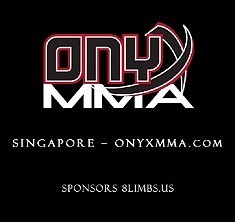 The designation of these fights being “professional” as opposed to otherwise in Thailand – where amateur is unusual and even 7-year-olds are professional fighters – is to distinguish between fights out in the rural fields, temples and provincial town centers versus permanent stadia and even televised fights. By this account there were also no other official Bangkok ring female Muay Thai fights until Rangsit stadium was built in 1996-97, a period of maybe 30 years. This does not mean that Thai women did not train seriously and did not fight for those three decades, they likely fought as a small minority in a side bet economy in temporary rings all around the country, just as thousands of men did. But 30 years after the fact Amnuay Kesbunrung took his Lumpinee idea and built an official and permanent stadium, just outside of Bangkok. What differentiated this stadium from others was that it had its own female ring next to a male only ring (to avoid pollution of the main ring’s blessings and magic); having two separate rings solves the issue that kept female fighters out of permanent stadia prior to this – apart from the issue of a lack of gambling interest, of course. Things were seriously looking up for female fighting, they now had a permanent ring near Bangkok. With the WMC established a few years before, with the authority of the Thai government behind it, bringing international values of equality to female fighting, Rangsit stadium began putting on regular female fights, and even all-female televised cards. Most significantly, Kesbumrung’s Muay Thai Institute in late 1998 built a dormitory for female fighters, essentially Thailand’s first professional fight team, and by 2000 (the time of these articles), it had produced their own star: the 16 year old Rung-arun Sor Fongnam. The second of these articles below, written for the Wall Street Journal, describes how Rung-arun, who found herself low on female opponents in Bangkok had been scheduled to fight against a boy. 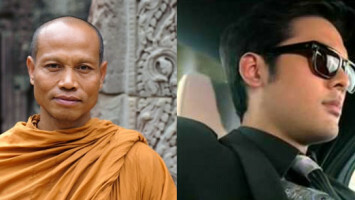 The fight, much like Phetjee Jaa‘s final scheduled fight against a boy, was canceled at the last minute. Six teenage girls live and train at Rangsit, among them the country’s hottest Muay Thai star Rung-arun Sor Fongnam. The lanky 16 year-old has already won 22 of her 23 fights and defeated several European champions [….] Having bested all the Thais in her weight class, she’s become a victim of her own success and has been sidelined for several months. Tonight Mr. Amnuay wanted to pit her against a novice male opponent–the first ever male/female match–but the World Muay Thai Council nixed the idea at the last minute. To be clear, by my guess this was likely not the “first ever” fight between a male and a female in Thailand. These days, at younger ages fights between boys and girls as children aren’t unheard-of (albeit not “common”) in the provinces, where female fights have been occurring for decades. 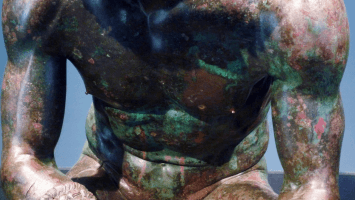 We may assume that such fights also have an informal history. But 16 years old is beyond the ages where it is now somewhat acceptable to see competition between male and female opponents; certainly having a fight like this in a stadium at 16 years of age is a “first ever” kind of event. A few years ago Phetjee Jaa was fighting boys on national television at age 11 and 12 until this was finally and suddenly stopped, under the presumption that she now was becoming a woman, ie, entering puberty, and such fighting was not appropriate. Let me say this much: to this day I hear disparaging assessments of the skill level of female Thai fighters, these days often coming from westerners who do not know Thailand or Thai Muay Thai very well on a personal level. It upsets me every time I hear it. In this case, as a female fighter who has fought a great deal all around Thailand I have some reason to question a story about essential inferiority of Thai female fighters and their humiliation at the hand of foreign fighters, succeeded by improved training conditions under the auspices of national pride. I will say I’m not exactly sure which 1990s fighting events this western fighter (quoted above) is talking about, whether they be early IFMA events, or Bangkok matches between western females and Thais. It could be that there was a dearth of skilled opponents in those matches, and that this may help explain the founding of female fighter program at the Muay Thai Institute itself, to build a stable of fighters for national representation. 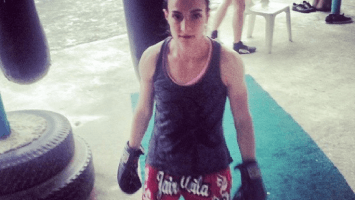 I have no doubt that western female fighters indeed encountered female Thai fighters who were poorly trained, or not prepared for western aggression – this still happens now, as western/Thai fighting styles, scoring and personal investments differ. This was the experience, the story told, but we should be careful to not quickly conclude that female western fighters in the 1990s were necessarily facing the best female fighters in the country. I’m not sure how much 1990s promotional female fighting reflected the general quality of Thai female fighters across Thailand, as much of it I assume was found in the provinces very far away from western/Thai meetings in the ring. Bangkok, I suspect, simply was not an avenue for Thai female fighters to make money at the time; money was better made in side bet fights, through gambling. Even today, when there is much more promotion and investment in female fighters on bigger shows, and more western fighters than ever, there are high quality female Thai fighters who may never make it to Bangkok (or the islands, or Chiang Mai, or wherever else westerners are most likely to encounter fights) and will never be seen by western fighters. I suspect that high-quality, family-trained female Thai fighters had been fighting in the provinces for some time, they just had not made it regularly to western female fighters in the 1990s – Bangkok opponents may very well have been hit or miss. There is at least anecdotal video evidence that indeed high level female Thais existed in the early 1990s and before. One of the earliest female western/Thai Muay Thai fights that I know of, Apple Dong Kong Far vs. Anne Quinlan in London, which was likely the first televised appearance of a western female fighter in Thailand (1990), resulted in a win for Apple who stood up against Anne Quinlan in a very close 5 round, 3 minute fight. You can see the full fight here. There may have been something of a size difference here, the advantage going to Apple (hard to tell), but there can be no doubt that Apple was a very skilled muay khao (clinch and knee) fighter. The rounds/time are unique, in that women generally fight either 4 rounds at 3 minutes or 5 rounds at 2 minutes, whereas men fight 5×3. Anne Quinlan herself is one of the best western female Muay Thai fighters in our short history, and had electric skills. It seems unlikely to me that Apple was an absolutely rare fighter in 1990. Even back then she must have honed her skills against other tough and well-trained female fighters to achieve her skill level in the late 1980s – fighters are not made in a vacuum. It seems more likely to me, in absence of other evidence, that early western fighters in Thailand instead encountered only a fraction of possible Thai opponents, and even that match-ups were not always even in all categories. 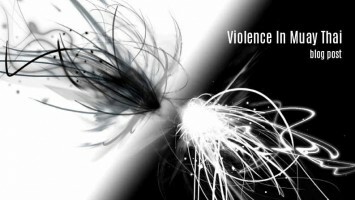 (In contemporary times experience and size are unequal between fighters, in order to try to balance the disparity; these fights are an attempt toward “fair,” but may not always be so in either direction.) We lack so many details of our history. These are only suppositions of course. There is very little written or recorded, and the experiences of western fighters themselves may only tell part of the story of Thai female fighters. My own perspective as a high-volume fighter tells me that there are layers of Muay Thai culture, and we as westerners are not always privy to them all. Festival fights are a good example. 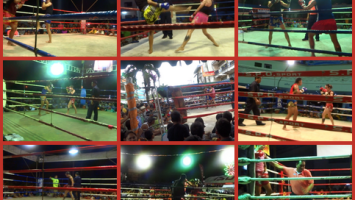 Often “festival and temple” fights are used as a euphemism in the west for low-quality fighters and events in Thailand. The general, dismissive picture is of local unskilled boys getting together to slug it out, but in reality some very high level match ups occur in festivals, driven by side bet gambling. Fighters will travel across the country to appear in a nowhere festival fight. I have driven through the absolute blackness of rice fields for miles in Isaan, not a light in sight, only to come upon the neon bulbs of a village festival with quality fighters. I have seen a thriving female fighter world in festival fights, including some of the very best female fighters in the country, with big money on the line, but these fights are almost completely unknown to and unseen by westerners, or even well-connected Thais who focus on Bangkok ring fighting. 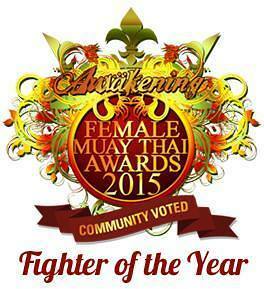 Female Muay Thai, in general, is largely ignored by the mainstream media. Muay Siam weekly devotes a page to female fight events now, but placement in the column seems connection-driven (the same gyms and stadia are featured while others are completely ignored), and is a tiny piece of female fight reality. My own trainer Pi Nu, who trains kids for Lumpinee and Rajadamnern, has almost no idea about female fighters in Isaan or elsewhere, and this is in the time of mobile phones, video uploads and fast communication. It seems it would be probable for very good female fighters to exist and fight frequently and still be unknown to most everyone in Bangkok twenty years ago, especially with no established female fight scene there. I report this here in a mix of very conflicted feelings. As someone who has been sexually assaulted, I cannot help but empathize with the powerlessness Salita must have felt in her accounting of the story. 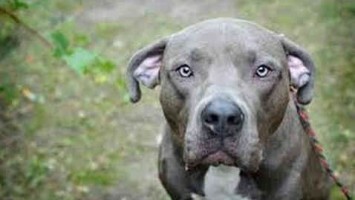 But the loss here is enormous to female fighting itself, too. There are very few Thai men who have pushed for the progress of female fighting as Mr. Kesbumrung has; which certainly doesn’t forgive or excuse the accusations against him, if true – it’s that he’s done good for the progress of female fighting as well. 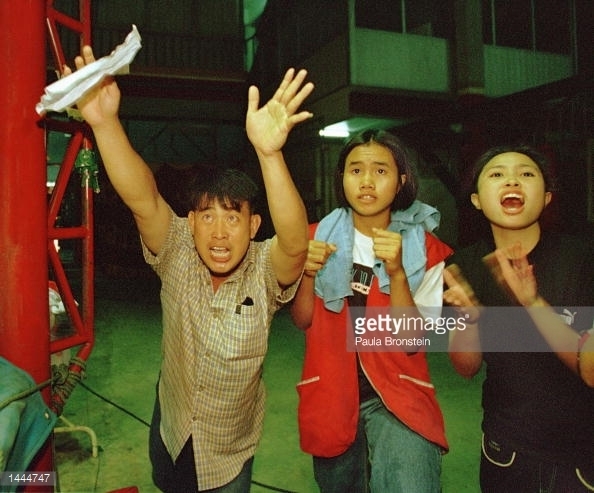 This fall from grace in 2001 was surely a fall from grace of Thai female fighting in the Thailand. Even to this day I can’t get anyone to talk about this, it is just not appropriate as a subject. In the west we put things out in the open, in Thailand things stay respectfully behind closed doors, and having lived here for some time now, I can feel that impulse. Mr. Kesbumrung continues to run the MTI and Rangsit stadium, and female fights seem to have been held there for much of the last 15 years in a progressive manner. He remains an historic force for female fighting, although the “experiment” of the female fight camp appears to have been written of as a failure due to the accusations against him. 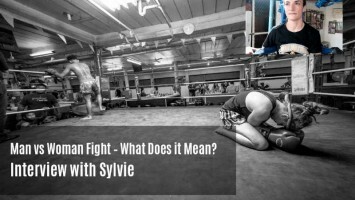 Despite the dismissive quote by the then owner of Sasiprapa Gym, at the time of the scandal Sasiprapa seems to have become a new haven for female fighting. Some of the MTI female Thai fighters moved to Sasiprapa, and early western female fighters like Anne Quilan found a training home there, and there is now a long history of western female fighters in alliance with Sasiprapa, from Julie Kitchen to today’s Fani Peloumpi and Martyna Krol (to only name a few). 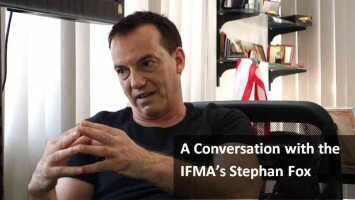 The Rangsit noble experiment and sudden end [the dormitory was shut down] threw female fighting in Thailand into another direction, and Thakoon, the son, and now manager of Sasiprapa, who had gone to university in the United States and is familiar with western values, has been part of big promotional female fighting efforts like World Muay Thai Angels. L. A. Jennings in her new book on the history of female fighting – She’s a Knockout – makes a point that struck me as profound in its truth and simplicity. 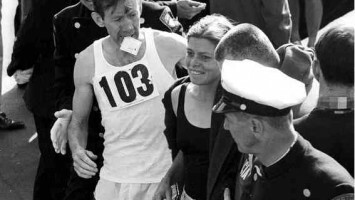 In her research she found that it was not the case that women have historically been excluded from fighting sports; we have always participated, but we have been ignored and therefore forgotten in the history of these sports. Female fighting has existed in the shadows of culture, and I suspect that this is really the case with female Thai fighting as well. Part of the difficulty we have is that as westerners we don’t regularly participate in the economies that supported most of the female fighting in Thailand. The other part is that early female western fighters, bold pathmakers that they were, did not leave a record of their fighting and experiences. There were very few newspapers and magazines telling their stories, it was not an age when video was cheap and easy, like it is today. We have only fragments. What is lost cannot be easily recovered, but as women we can start writing our histories now, so there is a foothold for future women, something to refer to; something to surpass. If there is no history, there is no story. 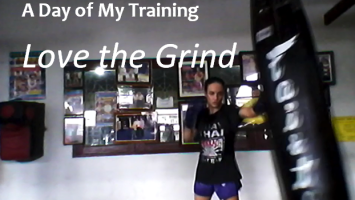 I would add that even though there is great variation in the training and skill level of the female fighters of Thailand – just as there is anywhere else – I do believe that they are the best Muay Thai fighters in the world, and that this quality of fighting skill goes back in time, back to fighters trained by their families for generations. 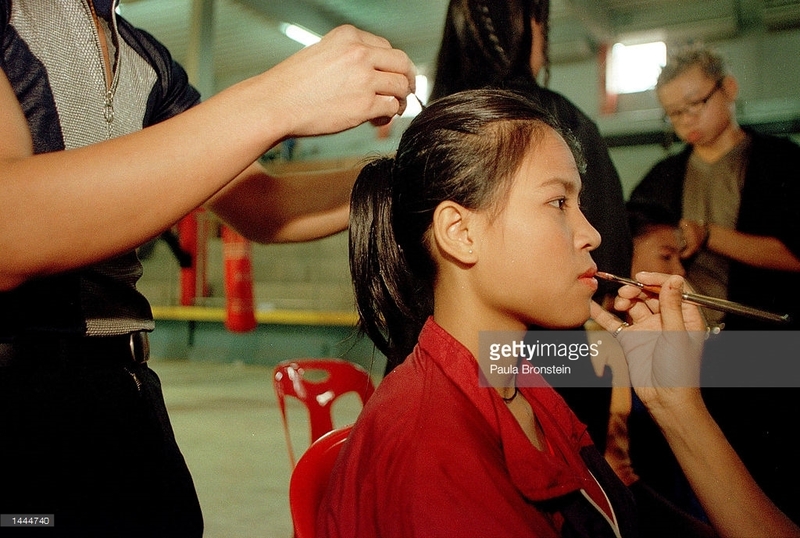 Below are photos of the Thai female fighters of Rangsit from the the year 2000 and the full articles about female Rangsit fighting. Fah Sathan giving the mongkol blessing to Rung-arun – I have only seen a female give the mongkol blessing once, and that was when Phetjee Jaa gave it to me. I’m not sure how rare this is. Care products. Hello kitty paraphernalia cram the shelves of the single wardrobe. On the wall, next to the scotch-taped poster of a local rock band, sits a small Buddhist shrine. The room’s 17-year-old inhabitants themselves also represent a standard cross section of Thai teenagedom. Jaeda from CHIANG MAI is currently relaxing in bed with a mudpack on her face. A ghetto blaster blares out pop tunes. Two portable fans at the foot of the narrow metal cot circulate warm air in her general direction. Her roommates Fah Sathan from Khon Kaen and Soi Dao from Chantaburi are not around, but several stuffed animals and a half-finished jigsaw puzzle on the floor attest to their recent presence. 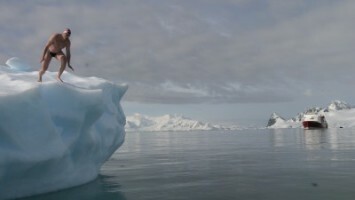 On closer inspection of the room, however, certain anomalies belie the ordinariness of its residents. 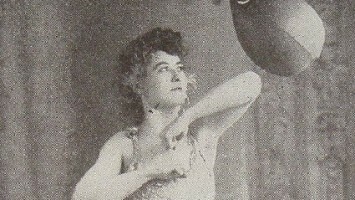 Among the tiny statuettes arrayed around the bridal doll is a framed photo of a young woman dressed in red satin boxing gear. Facing the camera, she assumes the classic MUAY THAI (Thai kick boxing) stance: knees slightly bent ,gloved hands raised. And instead of the dresses and blouses normally found in teenagers’ cupboards, this one is filled with sports apparel sleeveless jerseys, shiny satin boxing trunks and mini capes. The Buddhist reliquary too is unusual. In addition to the standard offerings of incense sticks, vases of fresh flowers and dried jasmine garlands, three mongkon (ceremonial headbands worn by Muay thai boxers at the start of a match) hang from the corners. 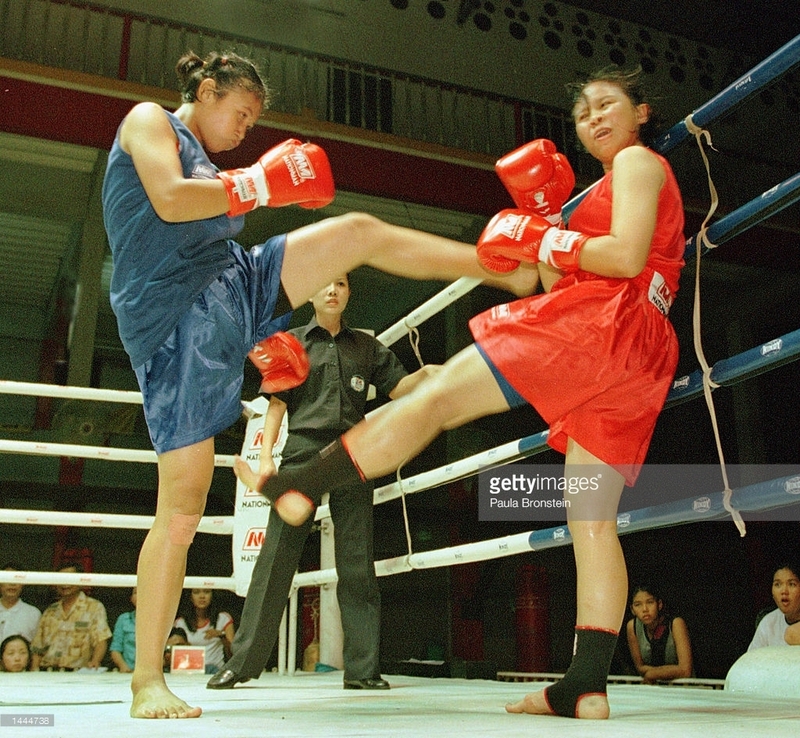 Actually, the young women are Nak Muay Ying (female boxes). In boxing parlance Fah Sathan fights in the junior flyweight category, Soi Dao is a flyweight, and Jaeda a pin-weight. Along with three other teenagers(including Rung-arun Sor Fongnom, the country’s hottest female fighter) ,they live upstairs at the Muay Thai Institute (MTI), an unimposing five-story structure located behind a disco on the outskirts of Bangkok. Ranging in age from 15 to 17, the girls train six days a week from 5.30am until 7pm-with time out for meals and naps-and attend high school on Sundays. The ground floor of the building houses the 2,000-seat Rangsit stadium which boasts the country’s first officially sanctioned boxing ring for women. Fah Sathan and her cohorts are in the vanguard of a quiet revolution that is upending the rarified male-only world of kick boxing in Thailand. Long-held superstitions and prejudices that women pugilists will jinx any ring they fight in have traditionally colored local attitudes toward nak muay ying. So what was it that created the second coming of kick boxing for Thai women? Essentially the impetus came from abroad. Over the last decade, women throughout Europe, Australia, the US and Japan have been taking up Muay Thai as a form of exercise and self defense. Wanting to test out their skills in the country where the sport originated, the foreign boxes came here only to discover a dearth of qualified local opponents. 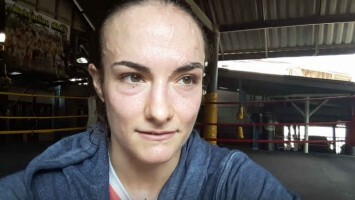 “Thai women weren’t being properly trained and the foreigners basically destroyed them,” recounts […] a junior featherweight champion from Ireland. 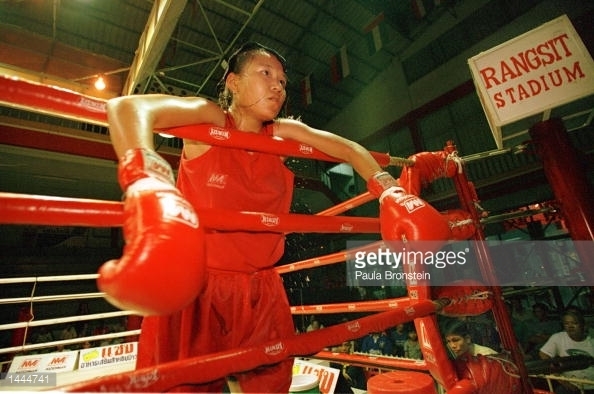 “It was humiliating for the Thais.” Under pressure to even up the boxing scores, in 1998 Amnuay resuscitated the idea of promoting women’s fights. This time, however, he decided to provide women — and any interested men — with an on-site school as well as just a sport venue. In conjunction with the World Muay Thai Council, he turned Rangsit stadium — the smallest of city’s three boxing arenas — into a certified training facility. Because the male fighters categorically refused to let women inside the existing ring, Amnuay had to build a second one. 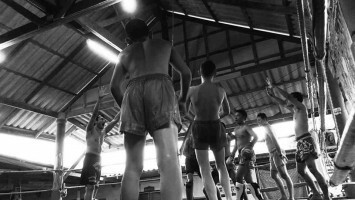 Despite the “separate but equal” facilities, male boxers still climb into Rangsit’s woman-only ring for their practice sessions, even though the ban on women using theirs remains in full sexist force. 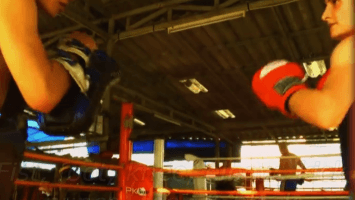 Nonetheless, Rangsit is a welcome alternative to most of the country’s provincial boxing camps and gyms which will not even let women into the premises, much less allow them to train. And the few that do offer training, hold them to their gender biases when it comes to entering a ring. Once inside the ring, Thai women fight just as intensely as their male countrymen. The only difference between the five-round matches is that men fight three-minutes rounds with one-minuted breaks, while women go for two-minutes with two-minutes breaks. In sharp contrast to the Thai stereotype of smiling gentleness, the sport combines graceful physicality with grunting savagery that can break bones and draw blood. Even the name of the various move conjure up an aura of violence: Mountain Overturns Earth, Break the Elephant’s Neck, Rama Pulls the Arrow String. As in men’s Muay Thai, each match begin with the ceremonial Ram Muay dance taken from the Ramakien ( a Thai epic closely based on the Hindu Ramayana). Wearing the traditional Mongkon haedbands created from written monk’s prayers that are wrapped in silk thread, the boxer move gracefully in the center of the ring, bowing in all directions. The dance is a mark of respect for the boxer’s trainer and parents. As Niamh explains, “It also serves to calm a fighter so she can take possession of the ring and feel safe there.” Supposedly in the past you could tell which gym a fighter came from on the basis of the style of the dance. Nowadays this is no longer true. Rangsit’s bi-weekly Saturday night matches attract female fighters from all over Thailand, Australasia and Europe. Nowhere near as profitable as the raucous, jam-packed matches held at Ratchadamnoen and Lumpini Stadiums, the events rarely pull in large crowds. Only when local champion Rung-arun, or one of the famous foreigners […], appear on the program does attendance rise above 100 spectators. The low turnout doesn’t seem to deter the contenders who, whatever their level of expertise, treat their opponents like humen punching bags. A well-fought match generates incredible intensity in and out of the ring. The increasingly frenetic rhythms of the traditional three-piece band and the loud shouts of “Oy, oy, oy” from the crowd ramp up the intensity still higher. The 63-year-old Amnuay works tirelessly to promote his “girls” at home and abroad. He has already taken Rung-arun, Fah Sathan and Soi Dao to Singapore for exhibition matches and dreams of organizing a fight between Rung-arun and Lila Ali (Mohammed’s daughter) in two or three years. Like many other Thai promoters and trainers, he’s extremely paternalistic — and strict — with his teenaged charges. 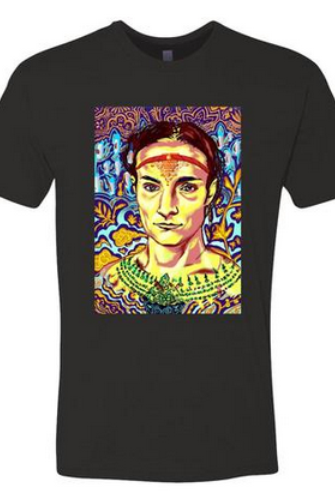 Those who flaunt his 9pm curfew can look forward to a close encounter with the bamboo stick. The age factor creates some interesting dilemmas. The current crop of Thai women contenders are mostly teenagers who come from low-income, rural backgrounds. Boxing gives them full-time career with unprecedented travel and money-making opportunities. Even so, most plan to quit the profession by their early 20s to get married. On the other hand, the realities of life outside Thailand mean few foreign women can afford to devote themselves full-time to a career that requires three- to four-week restorative breaks between bouts. Their training get sandwiched in between regular jobs and they’re often considerably older –sometimes by 10 years or more — than their Thai opponents. In a society like Thailand, where ages correlates with experience, the older foreigners are assumed to be stronger fighters. To even out the perception of the odds, women like the 20-something Niamh (who bagan her meteoric career in Bangkok in 1998) sometimes subtract a few years from their age. The fledgling career of one Thai Boxer may help change local attitudes towards age. Since childhood, 28-year-old Boontern Kijtmuti always wanted to be a boxing champion. After completing her basic schooling, she helped her mother selling noodle soup from a streetside cart in Bangkok before starting her own noodle vending business. By 17 she was married and soon had two sons (now 10 and 8) to care for. After her marriage fell apart, Boonterm decided it was time to pursue her dream. Leaving her sons with their grandparents, she took a part-time job in restaurant and began training. 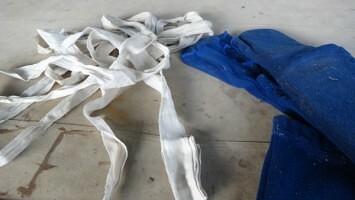 (To help defray costs, she also washes the gym’s laundry twice daily). In late June, after only three months of training, Boonterm won her first match at Rangsit Stadium. Meanwhile, both Amnuay and his Western-educated son Nutchakorn Kesbumrung (who holds the imposing title of deputy director of foreign affairs at MTI) devote most of their energy –and money — to changing the Thai perception of women boxers. Lacking and sponsorship, they defray the costs of the Saturday night bouts with funds from other family-run businesses (a disco and car dealership). At the close of typical Saturday night, Amnuay sits at the ticket booth near the entrance to the stadium and doles out money to the fighters. Win or lose, each yong women gets paid (usually US$25-$75). Not much compared to the fees for the highly lucrative men’s matches, but enough to sustain a sense of pride and accomplishment. Rung Petch casually hoists up her sleeveless jersey while a boxing coach adjusts her azure vinyl padded bra and crotch guard (the color complements the electric blue of her satin trunks) and a local TV cameraman captures the moment on video. She is preparing for a kick boxing match, which explains why she exhibits none of the prudishness most 16 year-old Thai girls have about their bodies. With so many men milling about modesty would be futile anyhow. In the cramped changing room at Rangsit boxing stadium, as in the world of Thai kick boxing (Muay Thai) in general, men vastly outnumber women. The almost deserted stadium hardly seems like ground zero of a Muay Thai revolution in Thailand, yet as the only venue in the country that offers separate boxing rings for men and women fighters it is. Amnuay Kesbumrung, president of Rangsit stadium and the MTI explains that Thai females kick boxed in the late 1960s. Back then Mr. Amnuay, a former fighter himself, spent three years trying promote the female matches but ultimately abandoned the idea because the predominantly male Thai fans refused to watch–or more crucially bet on–women’s matches. Superstition and prejudice color the Thai attitude toward female boxers. Let women anywhere near a boxing ring and supposedly they’ll jinx it. Until Mr. Amnuay built Rangsit’s second ring and launched a women’s training program at MTI in late 1998, the only place to watch women fighting was at provincial temple fairs and festivals. 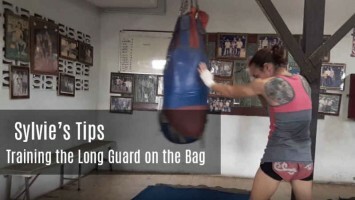 Even though videotaped segments of the female fights are now televised nationally every Monday night, boxers like Rung Petch still cannot climb into the rings at their local training camps. Six teenage girls live and train at Rangsit, among them the country’s hottest Muay Thai star Rung-arun Sor Fongnam. The lanky 16 year-old has already won 22 of her 23 fights and defeated several European champions, including Niamh. Having bested all the Thais in her weight class, she’s become a victim of her own success and has been sidelined for several months. Tonight Mr. Amnuay wanted to pit her against a novice male opponent–the first ever male/female match–but the World Muay Thai Council nixed the idea at the last minute. 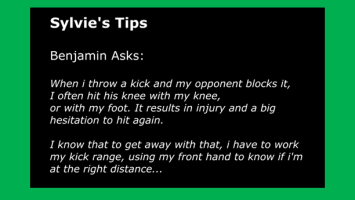 Muay Thai is not about standing still. Except when boxers get backed into a corner or clinch together with their red-gloved hands around each other’s necks, they’re constantly in motion. 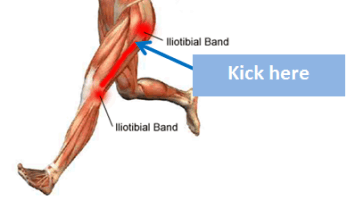 A good Muay Thai fighter never throws just one kick and stops; she immediately follows through with a knee, elbow or fist thrust at any part of her opponent’s anatomy. In the first bout of the evening, a greenhorn Japanese and a Thai rookie move about the ring but lack the requisite style and technique to get a rise out of the tiny audience. Coming on strong in the second fight, Rung Petch attacks her opponent’s head like a punching bag. The music reflects the fighters’ energy and the beat quickens. “Oy, Oy, Oy,” yells the crowd. After five grueling two-minute rounds, Rung Petch is declared the winner on points. 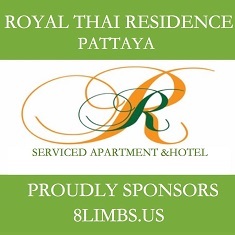 The resident Rangsit girls only emerge from their doll- and poster-adorned upstairs bedrooms for the final bout, between their own Fah Sathan and Arsako from Japan. Rung-arun shrieks encouragement from the sidelines as the two barefoot women trade an endless barrage of punches and kicks. By the last round Fah’s nose is bleeding and she appears utterly exhausted. Yet she kicks on (kicks garner more points than punches) and ultimately wins the fight. Barely five minutes after the end of the fights the spotlights are turned off and the plastic chairs stacked up. Sporting two-inch high platform sneakers, trendy jeans with rolled up cuffs and a sleeveless “Celebrating the Pooh Meaning of Friendship” T-shirt, Rung Petch minces off into the rainy night. 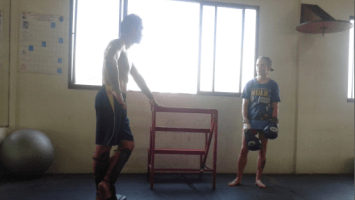 Amy Birch who was a fighter in Thailand in the late 1990s and early 2000s – she first came when she was 17 – made this compilation of her experiences, regretting that so little footage remains of her 50 fights. A 2003 report by a western female fighter seems in some of it’s descriptions to support the larger idea that there may have been top female talent in Isaan and elsewhere even in previous decades, and that fighters from Isaan and elsewhere may have lacked motivation to come to train or fight in Bangkok. Daoprasuk Petchopas, thought by many to be the best female fighter in Thailand at the time, was reported to have been undefeated, including against several western opponents, from at least 2001-2004.